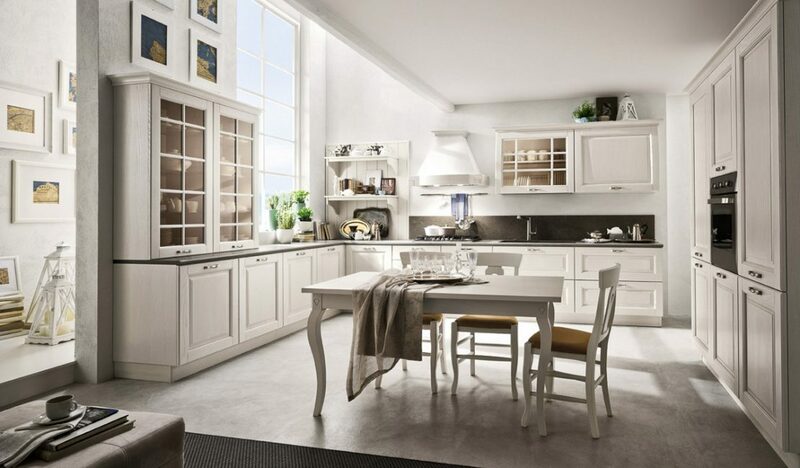 if your dream kitchen is one designed along the lines of a classic Italian kitchen, the most authentic Italian kitchen Sydney-based kitchen providers can offer is Eurolife’s Bolgheri design. 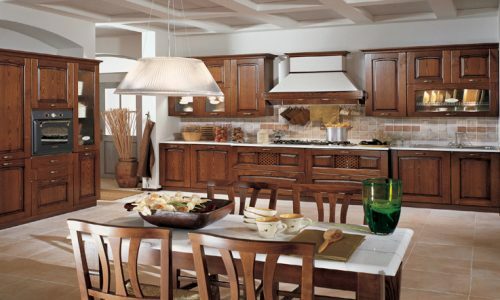 Good taste and social get-togethers are part of Italian tradition, which is mirrored in the Bolgheri furnishings. This classic architectural style is made up of elements in perfect harmony with the surrounding context, making your kitchen a natural extension of the home. 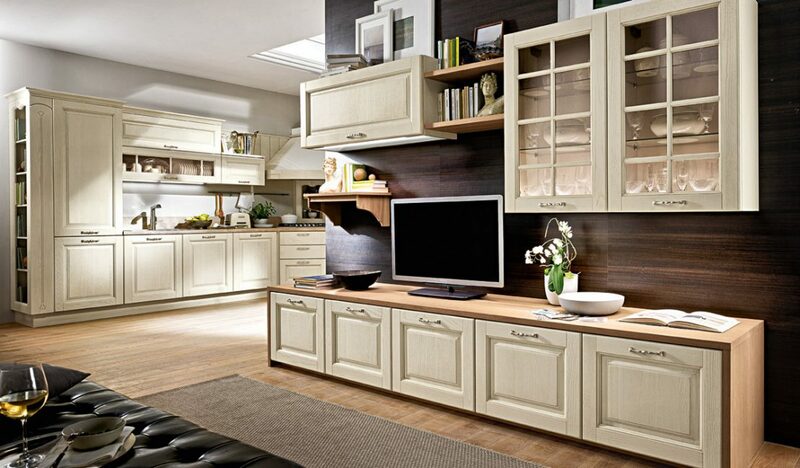 Eurolife only uses unique materials and finishes, making it the most sought after kitchen manufacturer in Australia. We are committed and dedicated to providing peerless quality and unbeatable prices, earning our rightful place as Australia’s leading kitchen provider. 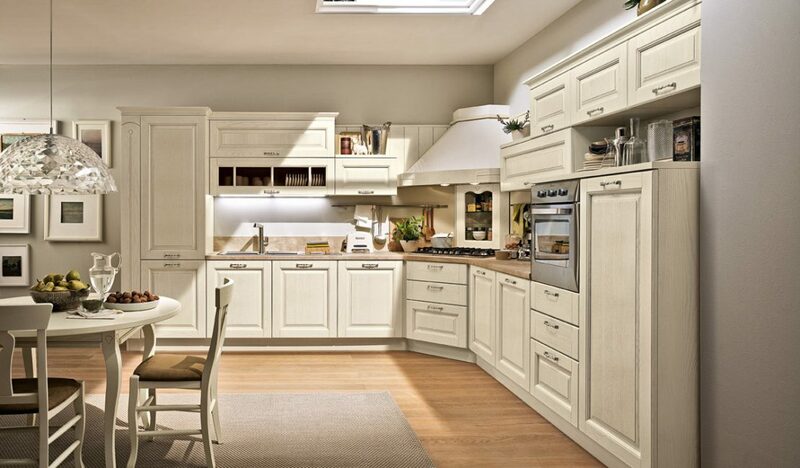 To view our extensive range of premium-quality Italian kitchens in Sydney , drop by our showroom today and let our friendly staff assist you with what you need. The fascinating magic of natural shades and much loved objects. 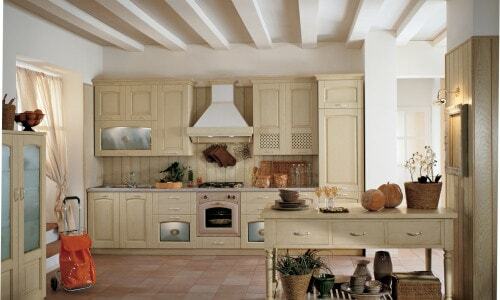 Those same feelings distinguish the Bolgheri style – a classic kitchen designed as a tribute to the typical little Tuscan villages displaying all the features of tradition. The colours are soft, pastel, like the delicate white cotton decapé finish that highlights the exquisite appearance of the solid oak. The lines are soft and well-proportioned; the wall units lightly rounded with an English style frame and semi-transparent bronze glass,decorated with an ornamental frame. Tradition and new technologies come together in the Bolgheri style, where it’s so easy and enjoyable to surrender to the passion for good cuisine. Everything’s tidy and practical, thanks to the multitude of containers like the large, fully sliding drawers with their internal fittings, or the spacious cupboards with their inner compartments. The whole is embellished by the understated elegance of simple yet striking elements, where the refined handle with its antique silver effect combines with the decorative frames of the wall units and tall units. 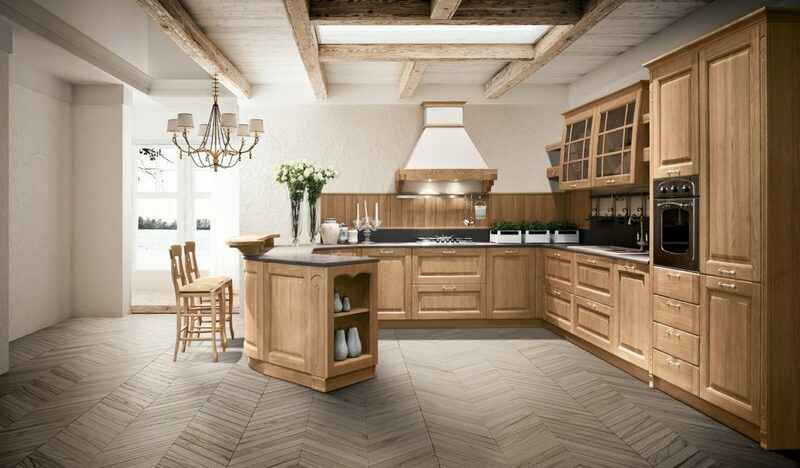 The design of Tuscan tradition lives again in the marvelous Bolgheri composition in natural oak – decorative yet prized. 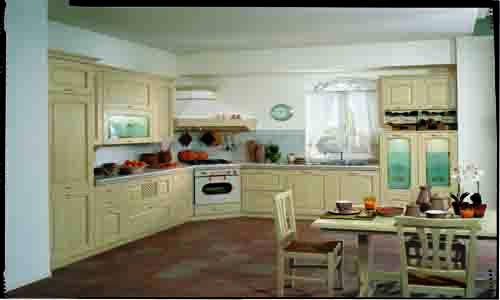 A taste that echoes the typical features of a welcoming kitchen, with the dresser at the heart of the picture; in this collection, it takes on a new, decorative role. 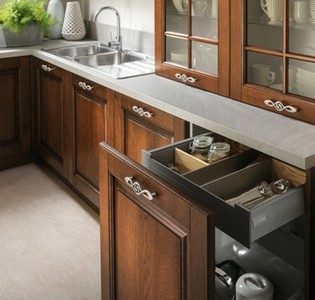 The work bench with breakfast counter has a curved, raised shelf in premium solid wood, its solidity emphasized with trimmings and understated engravings.